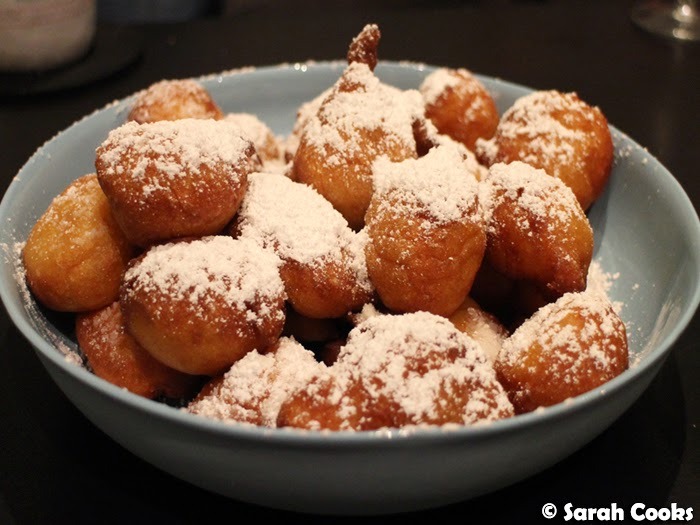 Mmm... check out that bowl of deliciousness: Nigella's baci di ricotta (from Feast). 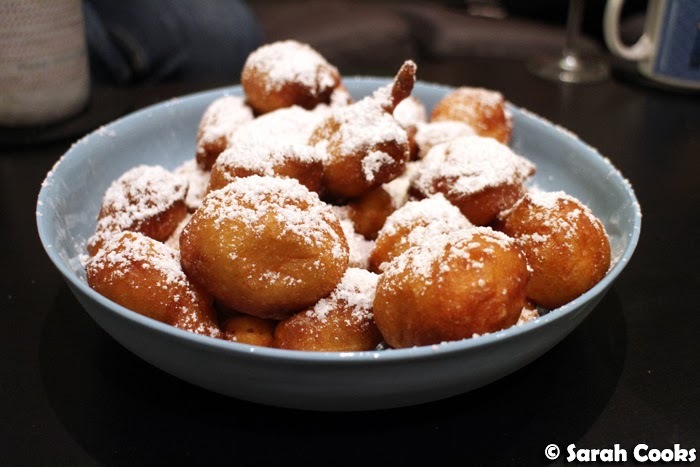 An airy-light ricotta batter, deep fried til crisp and doused with icing sugar. Heaven! I sometimes think I use dinner parties as an excuse to go crazy with the calories - and by way of example, look at my pork belly and pavlova; the richest chocolate cake I've ever eaten; salted butter caramel ice-cream with salted candied peanuts, peanut butter fudge sauce; a roast rack of pork followed by triple-chocolate custard tarts. Nothing wrong with that - if you're going to indulge with a decadent treat, better to share it around rather than have it all to yourself! This recipes for this meal all came from Nigella's Feast, one of my favourite cookbooks. 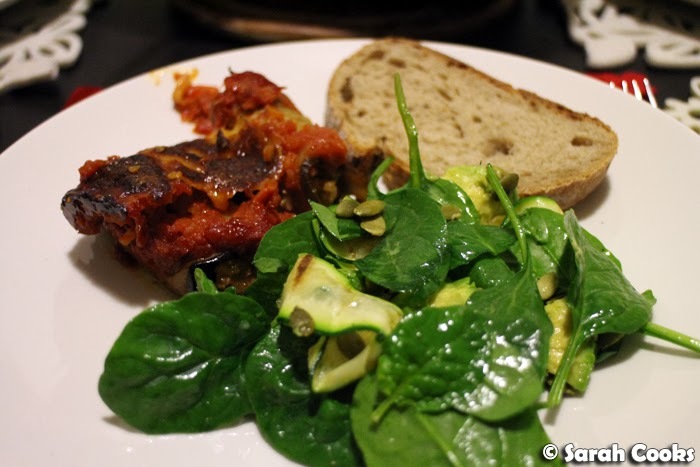 It's essentially the "Italian-Inspired Supper for Six" from the Meatless Feasts chapter, in reduced quantities, with Nigella's broad bean bruschetta instead of the Italianified guacamole, and a pimped up green salad on the side. (Recipe below!) The menu was a little time-consuming to put together, but these are some of my favourite recipes, so I was happy to devote the afternoon to cooking them. Broad beans! 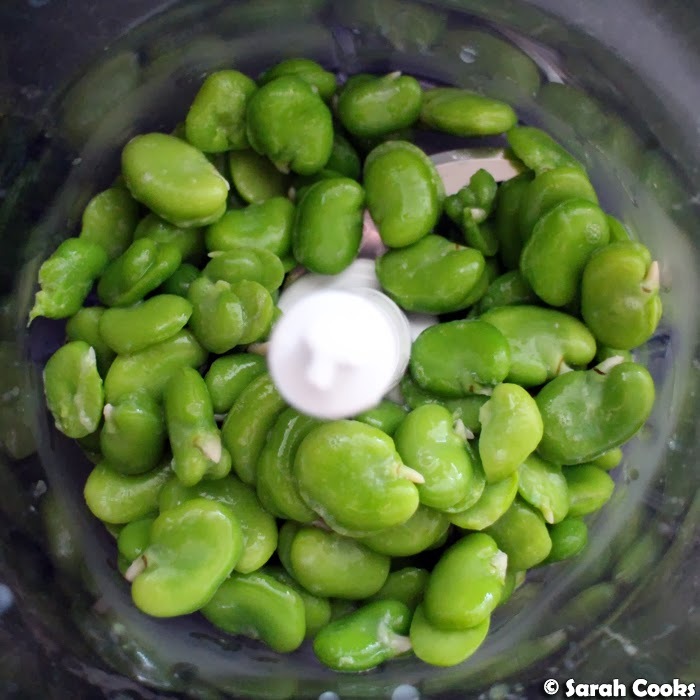 I love, love, love broad beans! And although Nigella says you have to use fresh ones for this recipe, I've always used frozen ones and it turns out fabulously. 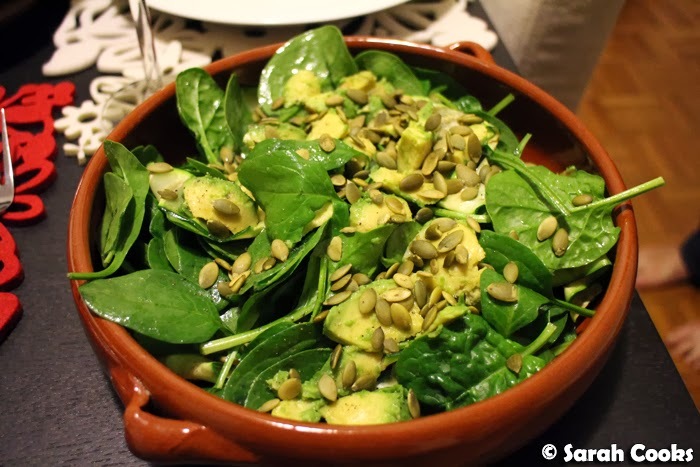 I added grilled zucchini to Nigella's suggested side salad of baby spinach, pumpkin seeds and avocado. I used a mandolin to slice them, and was so surprised when they fell in such a pretty pattern! 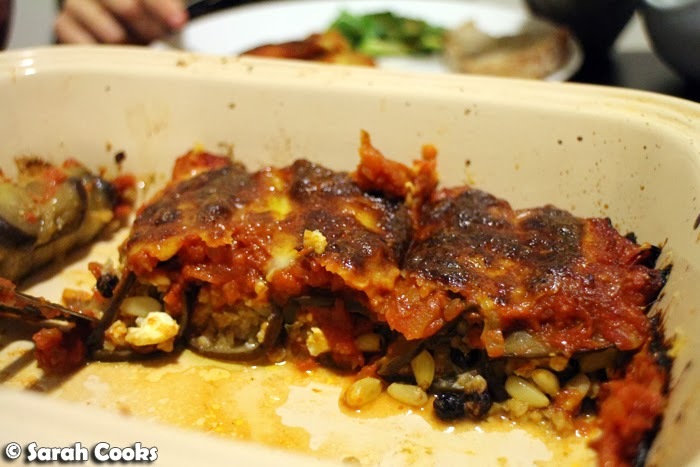 Now, as I've mentioned before, Nigella is super keen on involtini (grilled eggplant, wrapped around a filling, covered with tomato sauce, topped with cheese and baked), and has variations on this recipe in about half of her books. The involtini I made on this occasion weren't technically the ones in Feast, but rather a mash-up of all the different versions. 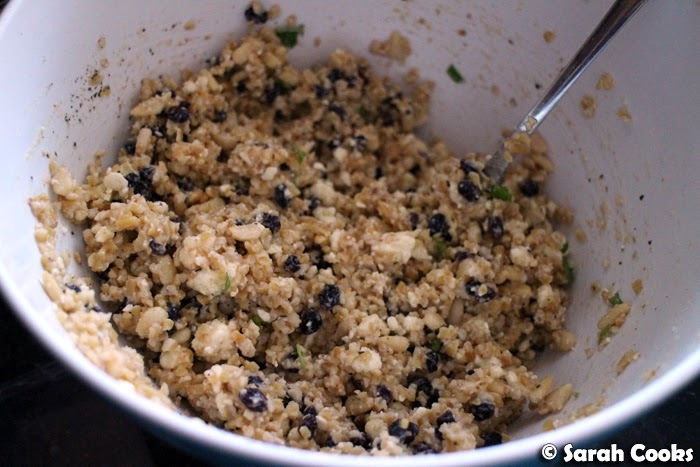 For the filling, I used feta, parmesan, pine nuts, currants, egg, parsley and lemon zest, with bulghur wheat for added bulk. Rather than smothering the pretty little eggplant rolls in a jar of tomato passata, I made a proper tomato sauce by sautéing chopped onion and garlic in olive oil, adding some tinned crushed tomatoes and slowly cooking them until thickened. Time consuming, yes, but I love tomato sauce, and it can all be done in advance, and just baked when you want to eat. Let's have a look at the meal! 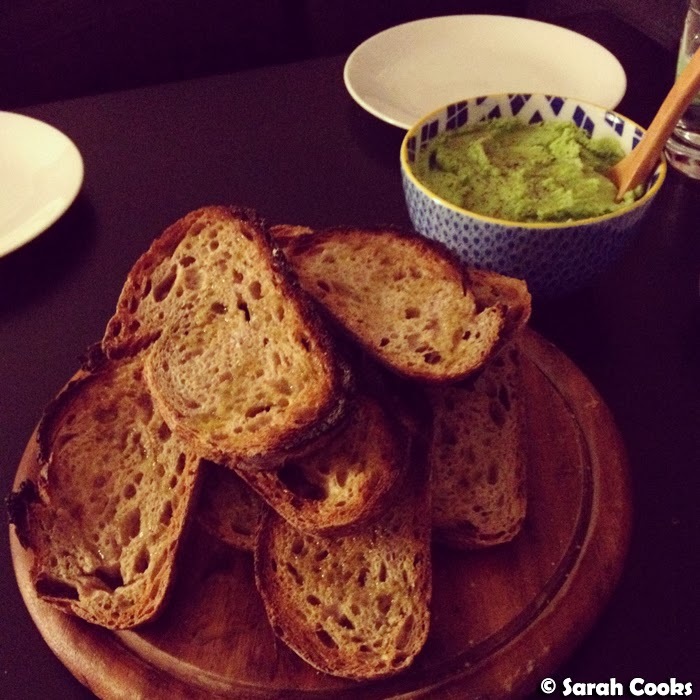 Look how green the broad bean bruschetta is. I love it! I served it with toasted light rye bread. (I wish I could say I chargrilled these slices, but I literally just toasted them in the toaster). Looking back at the pictures now, I see it was a pretty big pile of bread for four people as a starter - I must have been worried that we'd still be hungry, haha. (We only had about a slice each). These involtini are soooo delicious - I love the pop of sweetness from the currants, the mushy eggplants and the toasty melted mozzarella. And once all those lovely vegetables were eaten, it was time to deep-fry! It is a bit of work to have to cook dessert in the middle of a dinner party, but I thought it was actually a nice way to break up the evening - we all just headed into the kitchen to keep chatting while I prepared the baci. 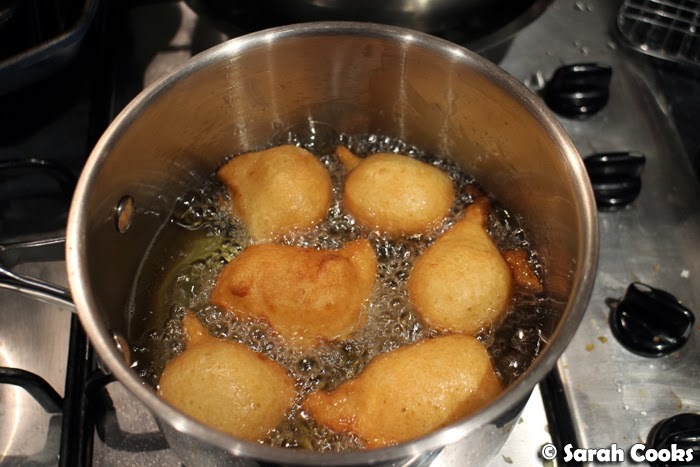 The batter takes just a minute to stir together, and the deep-frying process wasn't too difficult or scary, as I used a small saucepan keep the process manageable, and an oil themometer to take any guesswork out of the process. I love how they puff up into irregular little alien shapes! And if it was easy to make them, it was even easier to eat them! A thick dusting of icing sugar on top, a pot of tea on the side and... inhale! Heat a griddle pan over a medium heat. 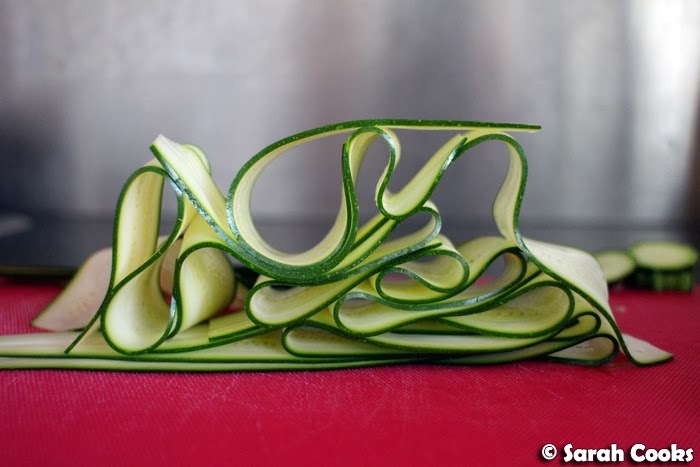 Trim the ends of the zucchini and thinly slice lengthwise. (A mandolin is ideal). Brush each slice with olive oil on both sides and grill for a minute on each side, until cooked through and marked with and char marks. Remove to a plate. Sprinkle generously with salt and squeeze a little lemon juice over. Let cool completely before assembling the salad. Toast the pumpkin seeds in a dry frying pan for a few minutes, until lovely and fragrant. (They don't really change colour, so use your nose to tell you when they're ready). 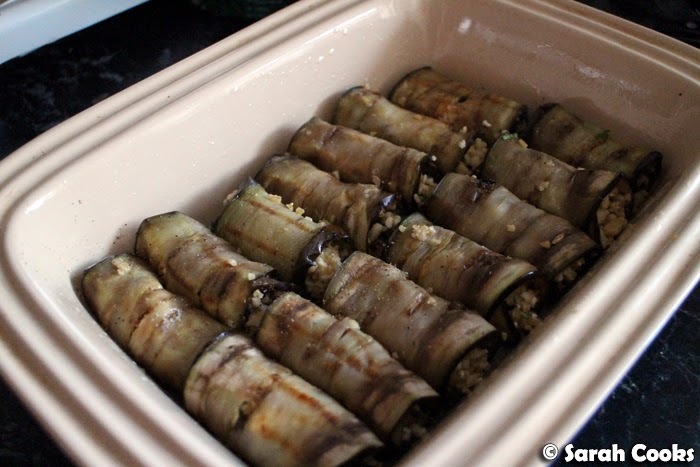 Tip them out onto a plate to cool down. When you are ready to eat, place the spinach leaves in a large bowl. Add the zucchini slices and half the pumpkin seeds. Cut the avocado in half, and scoop out little pieces with a teaspoon. Add to the spinach and zucchini in the bowl. Squeeze more lemon juice over, to prevent the avocado pieces from browning. Drizzle generously with olive oil. Toss to combine, and add salt and pepper to taste. Sprinkle with the remaining pumpkin seeds to serve. Amen on the broad beans, sisterfriend. 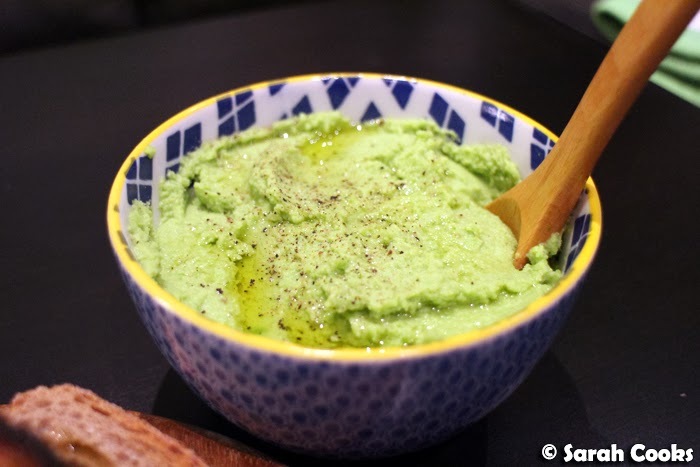 In my late teens, there was a period where every night for about two years — no joke, even after restaurant dinners — I'd eat a bowl of microwaved broad beans as a snack. Amazing. YUMMMM Sarah you host such awesome dinner parties at your place. You always whip up a storm which looks incredibly yet effortless to you. Let's do potluck again! Or, if you want to cook for me too, even better HAHA jk. Lucky dinner party guests! What a delicious meal.